Yes, I thought I might want to write a little about this. I'm still concerned that I might find tonight's special a little disappointing (though also still hopeful I won't), but even if I do, this went a long way towards marking the anniversary appropriately for me. I do very much love the William Hartnell era after all - enough that that is where my LJ username now comes from. And it is a great pleasure to be able to use the Doctor Who anniversary to help develop and refine my work-related thinking about anniversary commemorations, as well. It's fair to say, as Laurence Miles has done most forcefully (in a post now sadly deleted from his blog), that An Adventure in Space and Time both mythologised and stereotyped some of its main characters. It's all very well for Sydney Newman to keep on saying that Verity Lambert has 'piss and vinegar' in her veins, but if most of what we are shown instead is her being nervous and feeling out of her depth, it doesn't really hold weight. I also doubt that either she or Waris Hussein were quite so self-aware about their roles as pioneers for the causes of feminism and racial equality. But I get how a one-and-a-half hour drama has to work, and I get the effect of hindsight on how we read the past. In retrospect, Verity Lambert certainly does appear as a feminist pioneer, whether she knew it at the time or not, and to convey that effectively within the scope of the drama to people who may know nothing about her, she has to go through a dramatic arc - a big challenge, conflicts with men who stand in her way, a moment of self-discovery and then a triumph. In any case, this story was only half-attempting to show the real Verity Lambert, or the real story of Doctor Who's origins more widely, because it was only half about the reality of the past. Much of the cultural value of an anniversary lies in the fact that it makes us think not only about a particular time in the past, but also how it relates to a particular time in the present - in this case, today, Saturday November 23rd 2013. An Adventure in Space and Time showed us today's understanding of what Doctor Who means, ostensibly dealing with its origins, but filtered through a knowledge of what it became later on. All history does that to some extent, whatever claims we make to objectivity. Anniversaries just tend to bring it out a little more clearly. 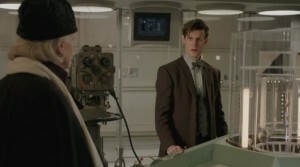 Anyway, as both a work of drama and a nostalgic tribute, An Adventure in Space and Time was brilliant. How right and apt to put William Hartnell at the centre of it all, and make it above all about his contribution and his story. There are a lot of people without whom Doctor Who would never have happened, or not in the way it did, as this story itself well conveyed. But Hartnell has a very strong stake to the claim that it would never have acquired quite the momentum, and therefore the lasting legacy, which it did without him. Both the script and David Bradley trod the fine line between conveying his brusque and difficult character and showing his warmth and investment in the role beautifully, and of course like everyone else I had fond, sad tears in my eyes at several points. I appreciated the five-minute slot afterwards, too, with his (real-life) grand-daughter and remaining on-screen Doctor Who colleagues sharing their memories - and was glad to see that his portrayal at least within the drama seems to have rung true for them. I might just see about making an icon of that, and having it be my 'anniversaries' icon, because it exactly, EXACTLY encapsulates how anniversaries are about the past and the present looking directly at one another across a gulf which cannot really be crossed, but somehow feels as though it can via the magic of numerology (here helped along the way by the additional wonder of television - cf the BBC camera and display screen both prominently visible between the two of them). I do wish I had known in advance that there would be so many cameos - perhaps not Matt Smith's, which I'm glad was a surprise to me, but for so many of the other (surviving) actors of the Hartnell era. I did spot Jean Marsh at Verity Lambert's leaving party, which was fab as I am a great fan, but otherwise they passed me by - and I feel particularly badly towards William Russell for that, as in retrospect his role as the BBC parking attendant was pretty prominent. But how great to have them, and how lovely too that this happened to be filmed at a time when the production team could make full use of the biggest cameo of all - BBC Television Centre, appearing as itself. From advance publicity stills, I had wondered how convincing any of the casting would be, including David Bradley. But it is a tribute to the acting abilities of all of them that once in motion, and able to make use of all the verbal and physical mannerisms of the people they were playing, past and present melted into one (as they should do in an anniversary context), and they became extremely convincing - well, except perhaps for Claudia Grant as Carole Ann Ford / Susan, who never quite seemed right to me. Naturally, I'd have loved more focus on Jacqueline Hill, even if sadly we could not have her in a cameo role. But I did appreciate the early scene with her and Verity Lambert together at a party discussing their careers, which apart from anything else meant a sound Bechdel test pass for the story. Anyway. 50th anniversaries are funny ones, I think. They stand on the cusp between memory and history. Enough time has passed for things to have changed a great deal, for memories to have become distorted, and for the need to reinterpret the past in a way that makes sense now in the present to have arisen. But it is generally not long enough for all those involved to have died, so that there is also a need for negotiation between direct memory and reinterpretation - sometimes both at work within the same people. If Doctor Who marks its centenary, which I very much hope it does, the line of direct memory to its origins will by then have been broken. It will all be about second-hand interpretation of the recorded past, via archives and photographs and interviews and of course the show itself. But it will be enriched by the fact that the 50th anniversary has served as a prompt to add to our collective store of direct memories, now while we can and before they are gone forever. Saturday, 23 November 2013: Happy 50th Anniversary, Doctor Who! This is really interesting. I didn't really place it within how people celebrate anniversaries really mainly because I don't really know much about the begining of Who at all but that show did make me want to look into it more. Cheers! My whole project around Augustus' bimillennium means I've been thinking a lot about anniversaries lately in my professional life (and enjoying doing so), so it is great to be able to apply the same thinking to my beloved Doctor Who. I don't really know much about the begining of Who at all but that show did make me want to look into it more. I think the producers of the programme would be very pleased to hear this. It's definitely done its job if it has inspired you to discover more. The idea of Hartnell as 'continuity geek' intrigued me, as I'm familiar with the tales of Hartnell insisting on using the same controls for the same functions on the TARDIS from early issues of DWM. This does seem to have been something which the early fans, watching at home, picked up on, hence the plans of the TARDIS console published in, er TARDIS in 1977/78 and republished in DWM in 1983, which were based on the notes of observant fans at the time, with a little imagination. I particularly liked the way Hartnell ended up taking over the job of switching the TARDIS rotors on and off, after getting frustrated with studio technicians who didn't know how to, or didn't know when they were supposed to be on. I thought it was a very powerful metaphor for conveying how much he personally did to 'drive' the show and make the magic happen in those early days. PS I am getting very excited by how Matt Smith's outfit is becoming increasingly more and more like William Hartnell's (we have come a long way from the original tweed jacket and teddy-boy trousers), and how advance publicity shots for Peter Capaldi are also suggesting that this trajectory will reach its fruition in him. It fits very nicely with the 'full circle' feel of the anniversary episode, and bodes well for a Hartnell fan such as myself. It was a great metaphor, wasn't it? Also true in that though Hartnell was complained about a lot by colleagues, certainly after Verity Lambert left, he was the only person remaining from the founding few who was regularly involved with the programme. His proprietorial behaviour was entirely understandable, and the film was sympathetic to his belief that if a job is worth doing it's worth doing well, something I've tried to stick to (though lapsed in extremis when ground down by, say, a voluntary activity which has stopped being its own reward).